Walther, Gay & Mack, PLC’s primary focus is providing our clients with the highest quality of work in the most cost-efficient manner and treating our clients with the utmost respect. In order to achieve this objective, we recruit ethical, well-rounded, and well-educated people and commit to train and foster their efforts to become the best in their field. Our client driven approach emphasizes reliability, creative alternative solutions, responsiveness, results and effective counsel. We hold our reputation as our most valuable asset and keep integrity and honesty at the heart of our firm. We are privileged to have an exceptional group of individuals working in support capacities at Walther, Gay & Mack, PLC. These individuals provide prompt and friendly service to our attorneys and our clients. 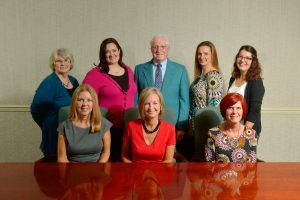 We foster a “family” work environment in our office and when you are one of our clients these individuals make sure you feel as though you are part of the family. This content does not constitute legal advice. Please seek counsel to determine the application of the law to your specific situation. The content posted on this page is copyrighted to Walther, Gay & Mack, PLC. We are a debt relief agency. We help people file for bankruptcy relief under the Bankruptcy Code.